After two years in the making and two years in the waiting for us fans, Exhibit B has finally reached the market. Does it deliver on its promise? Because Exhibit A-The Atrocity Exhibition was just a massive, massive album that opened a new world of possibilities for Exodus. Sadly, this is not the case for its hotly anticipated sequel. The past decade of activity from these once dormant Bay Area thrashers has produced a mixed bag of delights. 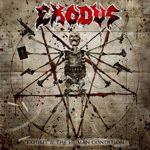 While Exodus are now in leaner form than ever before�not to mention incredibly popular�their excellent comeback Tempo Of The Damned led to the lukewarm riff-fest Shovel Headed Kill Machine, then came the peerless Exhibit A followed by ... well, the wheel has turned once again and Exodus have taken the proverbial two steps back. While all the usual Exodus goodies are present on the album, be it Gary Holt's murderous riffs or the abrasive lyrics that straddle the line of 'brutal' and 'plain disturbing' with reckless indifference, Exhibit B is another lesson in violence plagued by filler. To save precious time, skip the clunkers and feast on the epic meat grinder Class Dismissed for a taste of latter-day Exodus goodness. Promise, it will make your blood circulate faster. After chewing on its best cuts, the problem with Exhibit B is the surprising number of by-the-numbers tracks that come thick and plentiful between the its best offerings. The Ballad Of Leonard And Charles is a perfect example. By the time the intro is dead and gone Exodus come out swinging and it's plain 'meh.' The machinegun drums, spitfire vocals, and hurricane of razor riffs have long been done to death by everyone from Shadows Fall to Evile since 2007, so its appeal has finally worn thin and you feel letdown. Besides the midtempo delights Nanking, Hammer And Life, plus the anti-religious tirade March Of the Sycophants, little else except familiar territory is trodden on by the band. Some of you might take a shining to the quintet's reliability while others won't. For common ground, go right ahead to Burn, Hollywood, Burn, an incendiary no-holds-barred rollercoaster that takes dead aim at Lindsay, Miley, Paris, and Britney. The Sun is My Destroyer, the nihilistic Good Riddance, and the U.S.A only bonus track Devil's Teeth register high on the satisfaction scale too. Exhibit B is not a masterpiece, but it's still an enjoyable thrash barrage. Exhibit B is not a masterpiece, but it's still an enjoyable thrash barrage.